The Kemach Foundation is a non-profit grant making body which serves all Haredim in Israel by providing scholarships and job placement that enable them to join the workforce so as to better provide for their families and contribute to the economy of Israel. 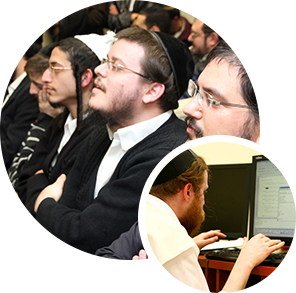 The Kemach Foundation (Haredi Professional Development) is currently the largest and most central agency in Israel, accelerating the pathway for Haredi individuals to pursue qualifications and skills to enter the Israeli workforce. In recent years, the subject of Haredi higher education and employment has become a topic of major focus amongst policy makers both in universities and Israel’s government. The issue of Haredi education and employment has a direct impact on the participants and their families, as well as numerous positive implications affecting issues of social tolerance, poverty, welfare, social mobility and fiduciary responsibility to the State. The approach constantly balances the documented gaps in the labor market while building skilled human capital and preserving the Haredi lifestyle. The Kemach Foundation advocates for the Haredi public and ensures that the rights and needs of the Haredi student are met, regularly monitoring workforce trends and ensuring the attentiveness and cooperation of government entities, so that the right incentives are given in the necessary professions and fields. Sometimes, all that prevents us from pursuing an education is financial constraints. It is thanks to you that I pursued my BA and succeeded in realizing a dream even at my more advanced age. My son, too, was assisted by you. I have just one thing to say: Thank you! I have no words with which to thank you for your help. Without your support, I would never have attempted these studies, and certainly would never have become a university lecturer. There would have been no way for me to reach the place where I am at today. Thank you! You have made the impossible become possible for me.